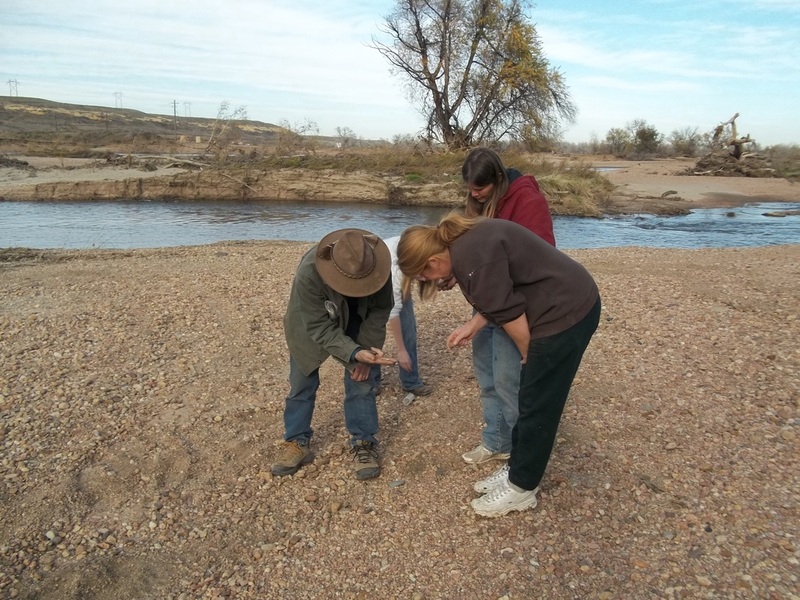 On November 9, 2013 we visited with our daughters who live near Platteville on the South Platte. About one/quarter of a mile from their houses is the site of Fort Saint Vrain which overlooks the South Platte River. In September of 2013 eastern Colorado experienced a devastating flood. The area we visited is down stream from the confluence of the Saint Vrain creek and the South Platte about one mile. It is up stream from the Big Thompson river. Normally the exposed gravel bars are over grown with willows and grass. 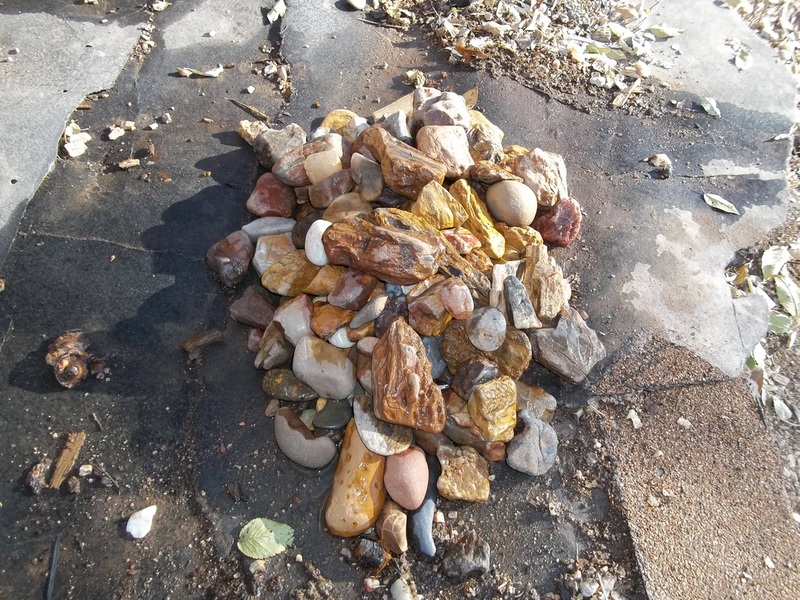 The recent flood event washed away all of the top soil, and rearranged the older gravel beds, exposing new material. The South Platte is one of the two main tributaries of the Platte River. It joins the North Platte river in western Nebraska to form the Platte River. The South Platte is formed in Park County, Colorado in the South Park grassland Basin, by the confluence of South Fork and Middle Fork, approximately 15 miles southeast of Fairplay. Both forks rise along the eastern flank of the Mosquito Range. Draining miles of the Colorado Mineral Belt. The South Platte flows through fifty miles of Platte Canyon joining North Fork near Waterton Canyon emerging from the foothill southwest of the capitol city of Colorado, Denver. 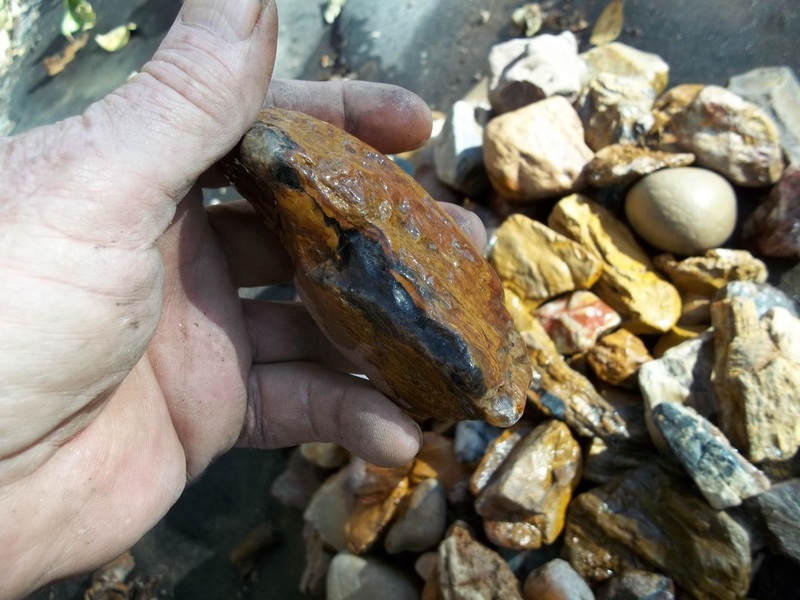 The gravels of the South Platte arriving from this long stretch, can contain Gold, Silver, Platinum , Topaz, Quartz, and does contain Petrified Wood. Our collection for the day. 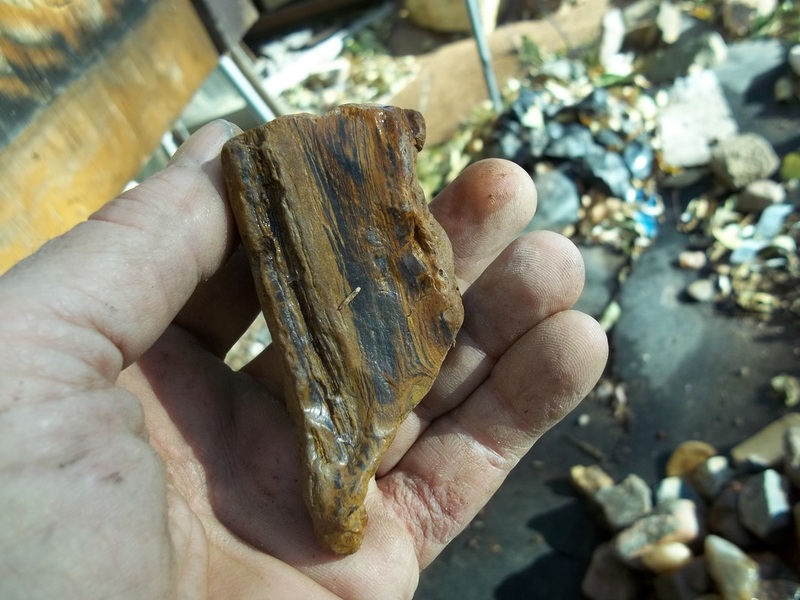 Nice pieces of petrified wood. Oh what fun it was searching for these treasures. 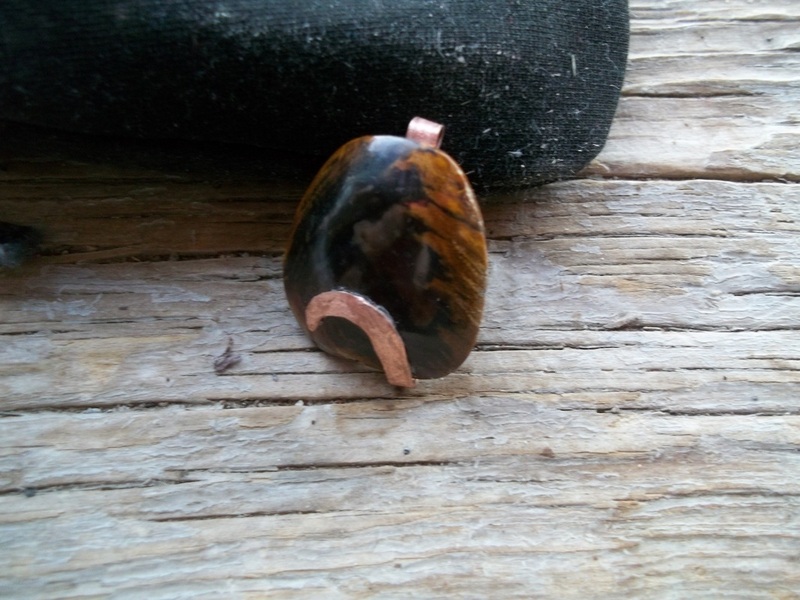 Here is a picture of a cabochon I made from a chunk of the petrified wood. I tried to hide a flaw with the copper mount - you can see it at the top of the hook on the bottom of the stone. My daughters and I rock-hounding the gravel bars. We spent three hours searching, no GOLD. But we sure found a bunch of interesting precious (to me) rocks. It is an eye opener to see how quick our environment can change. In a few short hours miles of fencing was washed away. We found one stretch of fence, over three hundred feet long, where the steel posts were turned on end with the blades that are normally driven into the ground on the top - looked like someone drove the post upside down, the whole fence was twisted 180 degrees; a big cost to the land owners to replace - ~$2.00 per lineal foot.. The river abandoned it old channel, creating new channels, in some areas it is hundreds of feet away from head gates for irrigation ditches. Of course this is a drop in the bucket compared to the lost of housing, automobiles, equipment, infrastructure, pollution of the environment and the lives of those that perished. three- dimensional representation of the original matter. Elements such as manganese, iron or copper in the water during the petrification process give the rock a variety of colors. The wood found at this site for the most part is very stable with great color but not in large chunks. 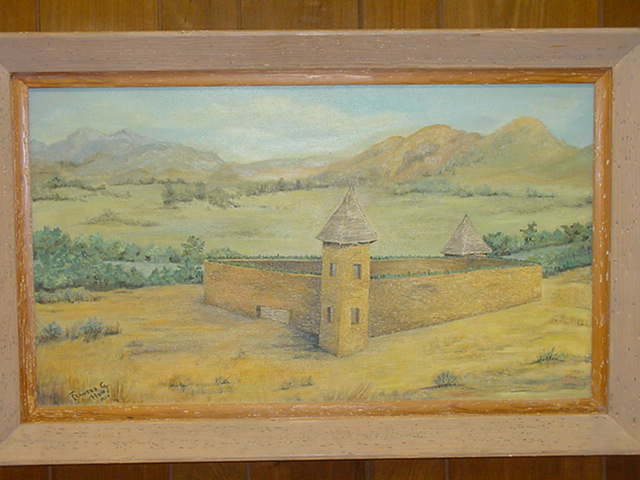 A Bit of History of Fort Saint Vrain. BY COL. CERAN ST. VRAIN. FRANCIS PARKMAN AND KIT CARSON. The creek is formed by the confluence of North and South St. Vrain creeks at Lyons. The creek rises in several branches in the foothills of the Front Range northwest of Boulder. Middle St. Vrain Creek rises along the continental divide, west of St. Vrain Mountain. It descends in canyon to flow along State Highway 7 and past Raymond. It joins the shorter South St. Vrain Creek about two miles below Raymond. North St. Vrain Creek rises northeast of St. Vrain Mountain near Allenspark and descends in a canyon to the east. The two branches join the mouth of the canyon. East of Lyons, the combined stream flows southeast through farmland and ranch country, passing south of Hygiene and entering Longmont. It passes through the south side of Longmont where it is rimmed by a greenway trail and several parks. East of Longmont it flows generally northeast, meandering through a wide river bottom in ranch country. It joins the South Platte from the west just upstream from the ruins of Fort St. Vrain and approximately 4 miles northwest of Platteville. When Captain Fremont, and his guide Kit Carson, stopped at Ft. St. Vrain on one of their Rocky Mountain expeditions, it was on the Fourth of July, 1848. A celebration was called for. William Gilpin, a future governor of Colorado was in attendance and wrote of the day's festivities. He told of some Cheyenne Indians who were extremely impressed with the flag waving and the booming of the howitzer. They all enjoyed the "barbaric luxury" of dining on "macaroni soup, buffalo meat, fruit cake, and ice cream frozen with snow from Long's Peak!"